Brought to you by GEO ExPro and Drillinginfo. The Dorado-1 well discovers more oil in the Triassic Caley Sandstone Reservoir and gas condensate in the Baxter Member; exploration update for offshore Australia. Map showing location of the Dorado-1 well, offshore Australia. 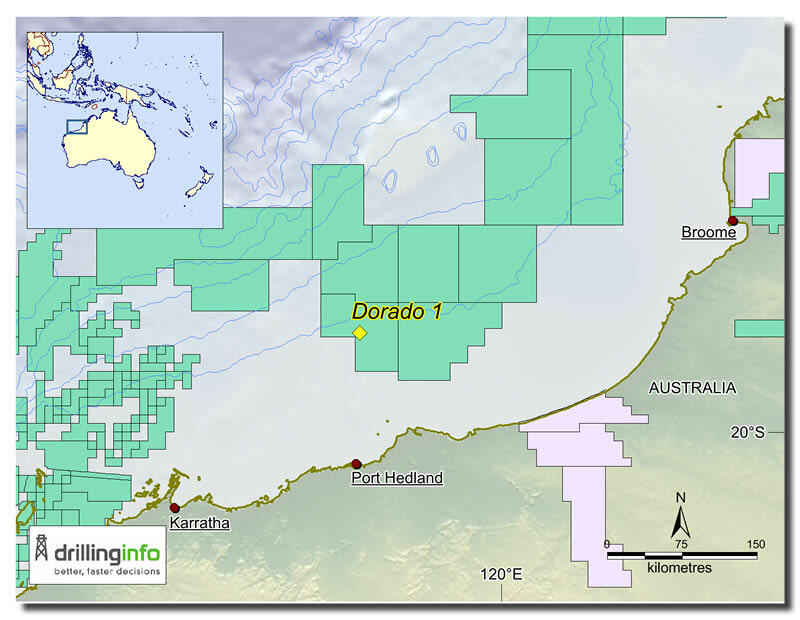 Originally spudded in early June 2018, the Dorado-1 well on block WA-437-P off north-west Australia has discovered oil at a number of levels. In July it was reported to have intersected approximately 80m net (96m gross) of light oil pay in highly porous and permeable sands in the Triassic Caley Sandstone and over 21m of gross interval (10.5m net pay) of gas and condensate reservoir in the top of the Baxter Member. Further drilling to a TD of approximately 4,650m has now discovered more oil in the secondary objective of the deeper Crespin and Milne Members, bringing the total net hydrocarbons pay encountered in Dorado-1 to 132m. The Crespin Member sandstone reservoir contains a gross interval of 50m with a net pay thickness of 22m and average porosities of 14%. The Milne Member sandstone reservoir contains a gross interval of 30m with net pay thickness of 18m with average porosity of 13%. The well, operated by Quadrant Energy Pty Ltd., lies about 100 km north of Port Hedland in about 3,000m of water. Quadrant hold 80% of the license and Carnarvon Petroleum Ltd. 20%. This exploration update is brought to you by GEO ExPro and Drillinginfo. In 2018, Sharjah's first onshore licencing round opened, offering companies 30-year contracts in an area with a production history demonstrating a 90% recovery factor. The South China Sea, a marginal sea between Asia (the largest continent) and the Pacific (the largest ocean) covers an area of 3.5 million square kilometres and is surrounded by sedimentary basins, some of which have produced petroleum for decades. The oceanic and the stretched continental crusts underlying the South China Sea have experienced a complex tectonic history in Cenozoic times, which geologists are only beginning to unravel.